As many of you may now, I am a bit of a Sony fan. That being said, it still does not preclude me from being harsh on Sony phones. They have had a tough time figuring out how to stay competitive and have always been late to the game. However, back in September Sony announced their first phone that actually started to surprise some people, the Xperia Z1. This phone promised to give great camera performance and was, for once, ahead of the curve when it came to specs. But did Sony actually deliver on what they promised? Check out my review to find out. I had previously said I really like the Xperia Z build quality, but had several issues. Well, it seems like Sony read my mind and fixed them. The previous plastic and glass framing has now been replaced by an aluminum frame, and boy does it feel great. It definitely feels way more solid and premium. It is still sandwiched between two pieces of glass, so if you didn’t like that on the Nexus 4 or Xperia Z, you won’t like it here. I did notice a couple scratches on both the front and back, but that may just be on the Sony-installed screen protectors, so the screens are probably fine. One of my biggest beefs, and probably reasons to not buy the Xperia Z, was that the edging was too sharp and would dig into your hands. Thankfully Sony has rectified this and made the edging more rounded and smooth. It is now way more comfortable to hold. So lets just tackle the elephant in the room right up front. This phone is huge. It’s got a 5” screen, but the physical dimensions of the phone put it slightly larger than the 5.2” LG G2. Them bezels are huge. This is an understandable tradeoff as the extra space is required for waterproofing, but could be a dealbreaker for you. I was up in the air about it at first, but after spending the week with this device, I grew to tolerate it. I found ways to hold the phone, but it was nowhere near as comfortable as the Moto X or Nexus 4. Keep in mind I also have small hands. The thinness of the devices does to a lot to make holding it more manageable. To me, the waterproofing was a good tradeoff over the large size, but you had better be careful when it comes to cases. It is very easy to make this phone unwieldy. If you are really desperate to have the Z1 and waterproofing, but can’t deal with the size, you can try and get your hands on Z1 f from Japan, although that’s a bit of a stretch. Rumour has it we may see it internationally, but those are just rumours after all. If you are a phablet lover, then you will not be too worried (but then why aren’t you buying the Note 3 or Z Ultra?!). The button placement has changed slightly. You will still find the familiar power button at the center of the right edge, above the volume rocker. Both the volume rocker and power button feel slightly smaller, and take some getting used to to hit them. I would have preferred them slightly larger. Above the power button you will find the microSIM tray. This one is a pull out tray, so you can leave your paper clips in the drawer. At the bottom is the much missed camera shutter button. Boy is this a nice addition for a phone, especially considering how camera-centric it is. It’s a two stage button, so once for focus, and again to take a picture. 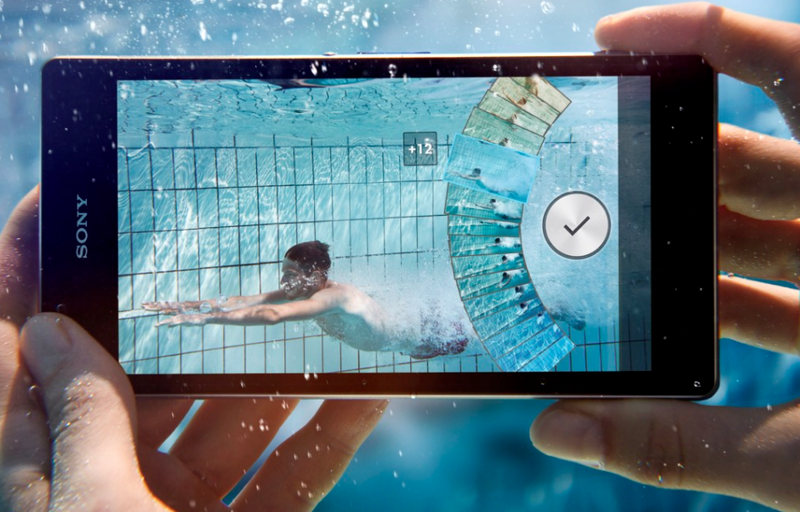 The added advantage to this button is you can now take underwater pictures (something missing from the Xperia Z). Along the top you will find a lone headphone jack that is, thankfully, fully exposed. Fear not! 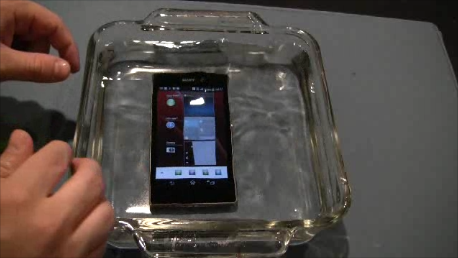 Sony has done some fancy engineering that still allows the Z1 to be waterproof without keeping it closed. Definitely a nice touch, because the headphone jack can be one of the most used ports on the device. Along the left edge you will find two flaps, the top one covers the microSD card slot, which can take up to 64GB microSD cards, and the bottom covers up the micro USB port. Just below that is the magnetic dock that will allow you to charge in landscape mode. Along the bottom you will find the significantly larger speaker grill. This speaker is a definite improvement over the disappointing Xperia Z speaker, but still nowhere near as satisfying as the HTC One’s Boomsound speakers. Still, it was nice to be able to hear audio outside of a quiet room. Be warned though. Since the speaker grill is on the bottom edge, it is very easy to cover up the speaker with your hand while watching something in landscape mode. Several times I have been wondering why the volume was so low, just to realize my hand was covering the speaker. The front is extremely minimal, with only the front facing camera, notification LED and Sony logo. I have to say that the clean slab look is absolutely gorgeous. The backside is nearly as minimal, with the Sony and Xperia branding, NFC logo (to tell you where to tap), and the much talked about 20.7 MP sensor (more on that later) with LED flash. This is probably Sony’s best designed phone to date. It maintains all of the great qualities of previous Xperia phones and fixes up some of the lingering problems. Any issues you may have with the phone size were design tradeoffs, and something you will have to consider if you seriously want to buy this phone. The Xperia Z1 screen size and resolution remains unchanged from the Xperia Z, but the new Triluminos display promises to create a richer experience and better viewing angles. I can’t say much about the viewing angles (they are still not the greatest, but definitely better), but the colours are absolutely beautiful on this device. When I first got it, the colours while watching movies and shows were odd, but an OTA update fixed a lot of that and now the colours are rich and realistic. Sony also makes uses of their X-Reality engine to improve graphical performance while viewing photos and videos, but I couldn’t say 100% if it really had an effect. You would probably be better off keeping X-Reality off and saving yourself some battery. For the first time ever, Sony has finally released a phone in line with the other flagships out there. The Z1 packs in the powerful Qualcomm Snapdragon 800 with 2GB or RAM, and boy does it show. This phone absolutely flies! Scrolling is smooth with little to no hick-ups and app load times are fast. Website rendering is done very well, definitely quicker than the Nexus 4 with the S4 Pro. It also comes sporting LTE with as many bands as they could fit in there. It has quadband GSM/Edge (850, 900, 1800, 1900), pentaband HSPA+ (850, 900, 1700, 1900, 2100) and heptaband LTE (Bands 1, 2, 4, 5, 7, 8, 17), which means it will pretty much work anywhere in the world, excluding the carriers still using CDMA, so long as you get it unlocked. This is mostly thanks to the S800, which can allow Sony to stuff that many antennas in. Still, before you travel, make sure you check what frequencies the country you are travelling to uses. You will also get 16GB of internal storage, but can be expanded up to 64GB of additional storage using a microSD card. 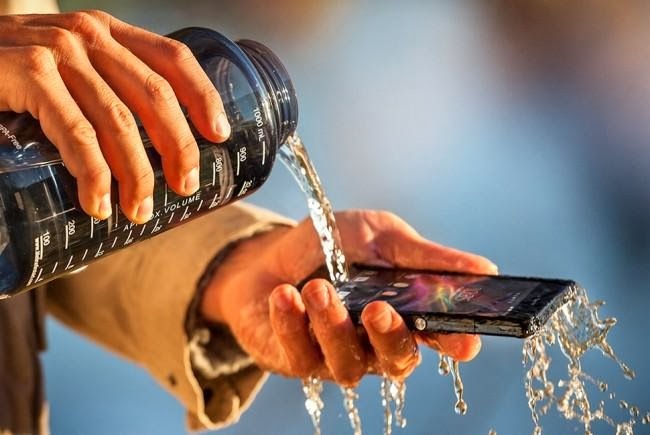 As with all of Sony’s recent phones, this one also sports waterproofing, but one up’s the Xperia Z with IP58 instead of the IP57, which allows it to go up to 1.5m of water for up to 30 min (but not salt water). With the new shutter button, it now is actually quite feasible to take photos underwater with it, and it does work well. It has now become a habit of mine to use my device in the shower of bath (like I wasn’t addicted enough to it!) without any worries. Even better is that the touch sensitivity is calibrated right and I can actually use the device well even with wet hands and water droplets all over the screen. I important addition for those needed to use their device in the rain. This is probably one of the best things about the phone. I can not express how nice it feels to not have to baby the phone all the time and just to use it when I feel like it. So, I have for the most part talked to death about the Sony apps and skin, so I won’t really touch on it too much. What I will mention are the changes that Sony has made to their skin and apps that is different. If you are interested in the whole run down, you can check out my review on the Xperia Z. The launcher has been cleaned up a bit and looks a little bit more refined, but still very similar. The drop down menu in the app drawer is now gone, replaced by a slide out menu that gives you options such as “Own Order”, “Alphabetical”, “Most Used” and “Downloaded”. You will also find options for uninstalling apps and shortcuts to the Play Store and Sony’s own Sony Select app portal (which basically just takes you to the app in the Play Store). I like the set up, but have yet to find a way to save the “Own Order” menu in the event of a factory reset. That was a bummer considering I spend a lot of time setting it up. The notification menu is mostly unchanged, only now you can add more or less toggles to the top, and the way they are ordered is tastefully done, without taking away from the rest of the notification bar. The multitasking window is the same, but this time Sony has allowed you to open more than one small app at the same time. A nice touch, especially for those super-multitaskers. 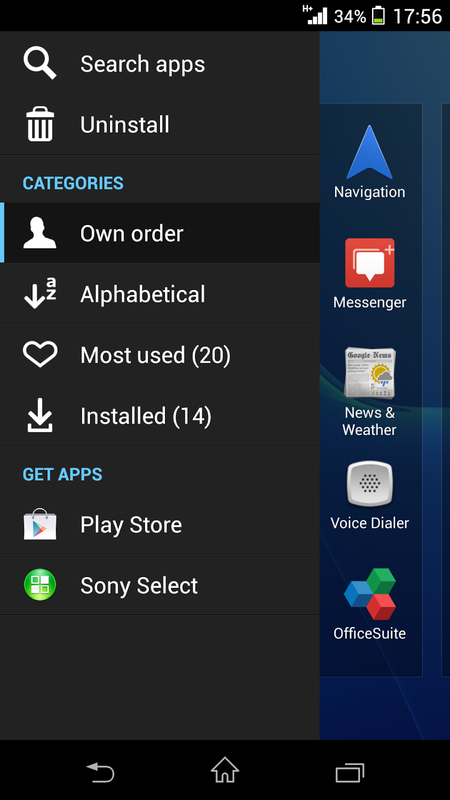 You would also notice that Sony has still not put the widgets in the app drawer. They have stuck with their long press to organize, and I have never been more glad they did. 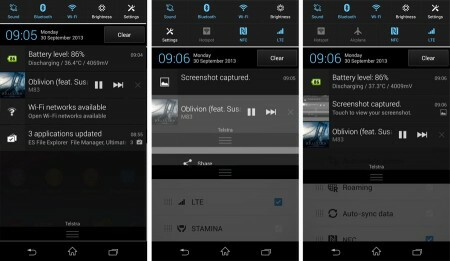 Sony has done something really novel with it, which has allowed you to drop many different types of widgets and organize them without losing your place. 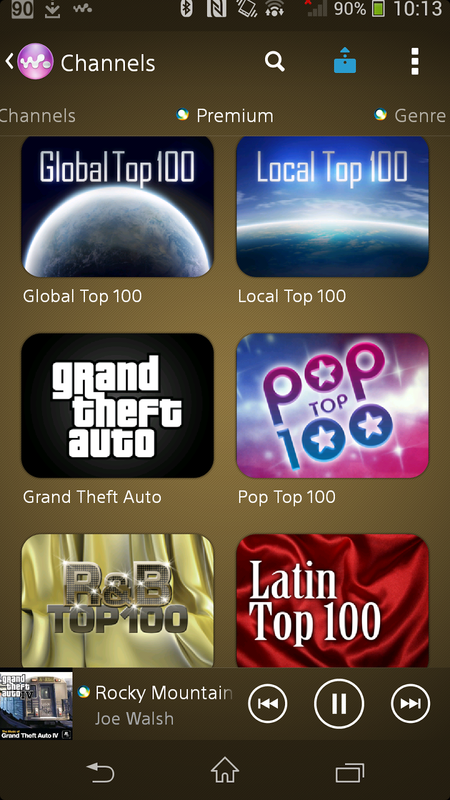 The theme select is also still there, and is mostly unchanged from previous versions. Sony has put the same assortment of their media apps on the phone, but this time the focus has been integration of their online services into the apps. Albums not only show the images stored on your device, but can also sync up with your Playmemories online account (Sony’s own photo storage solution), Facebook, Picasa/Google Photos and Flickr. The movies app not only shows videos on your device, but also the videos in your library on Video Unlimited (and if you buy a Z1, Sony will throw in 6 free movies). The Walkman app has now completely integrated with Music Unlimited, and now gives one of the best integrated experiences, short of Google Play Music with All Access, but we wouldn’t know anything about that. I still have strong dark feelings about the Music Unlimited app (it has really is a horrible experience), but with Sony ditching it and integrating Music Unlimited into the Walkman app, they have really made a compelling experience. PSM is also there, but it is as uninteresting as it has always been. You will also find your assortment of bloatware. The review unit Sony sent me was a Telus device, and the amount of bloat was actually quite small. Rogers has gone the opposite way and put a bunch of stuff you won’t need or want (Ringtones app that sends you to a browser? Really Rogers?). Fortunately, Android 4.2 onboard allows you to disable those apps to keep them from eating resources. And that is also the downside. Sony managed to release a phone with 4.2 on it with all the other flagships now sporting 4.3 and with 4.4 on the horizon. Fortunately, it should be getting the update to 4.3 in early December and 4.4 sometime in Q1. It’s sad to see that Sony couldn’t make 4.3 happen out of the box, but I’m not really sure it added anything to the device, other than OpenGL 3.0. Sony devices, along with other OEMs have been making Bluetooth 4.0 happen outside of google’s control for a while now, so you will still have that. This is where Sony believes that they can differentiate from the rest. They have packed in a 20.7 MP sensor on the rear of the Z1 and filled the camera app full of features. Most of the time you will be using the “Superior Auto mode” which does a pretty good job of figuring out what kind of lighting conditions you are in, and adjusts accordingly. It also takes a 20.7 MP shot, and downscales the image using their own algorithms to create a more crisp 8 MP shot. This is essentially what the Lumia 1020 does with the 41 MP shot. The shots that come out do look quite crisp and the colour reproduction is very accurate. Not too oversaturated or washed out. It also does a decent job of capturing motion (which is more than I can say for the QX10). It consistently spits out shots that I am eager to share. Flash is pretty standard. It would have been nice had they included the Xenon though. Low light shots are handled better than other phones I’ve used, but still not as well as a point and shoot/DSLR. There is your usual assortment of controls and functions Sony has put in their phones before, but there are several new additions. Sony has added a bunch of different features this go around. Some are really useful and some are just for fun. These were the same features that were leaked before the Z1 was announced. You have time shift, which take 61 shots, 30 shots 1 second before you press the shutter button, 30 shots 1 second after you pressed the shutter button and 1 at the press. It works great for trying to capture the right picture. It has worked great for us taking shots of my 11-month old son, because he tends not to pose. 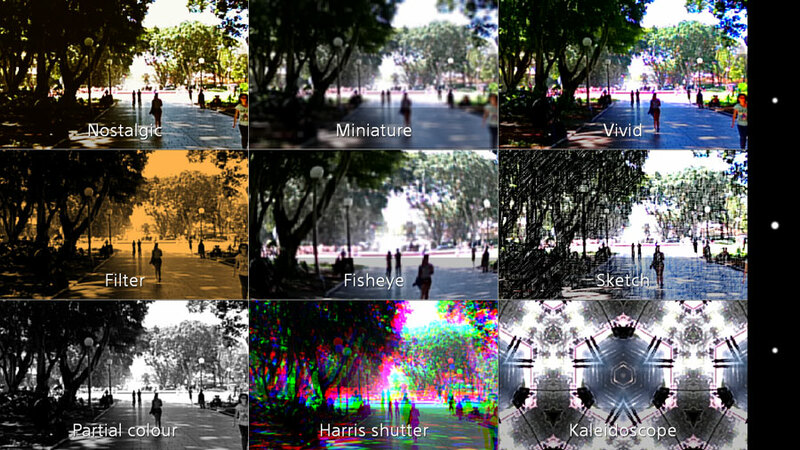 Picture Effect, a mode becoming quite common now, gives you a dynamic look at different modes and allows you to select one and shoot. All of them are artistic ones like sketch. Sweep Panorama works like other panorama shots, but doesn’t allow you to pick the extents of the panorama. You must sweep all the way, otherwise the app will add a black space at the end. This can be pretty annoying. That being said, I have never had much luck with the panorama on my Nexus 4 (my hand never moves straight enough), but this app worked better at maintaining stability through the sweep. 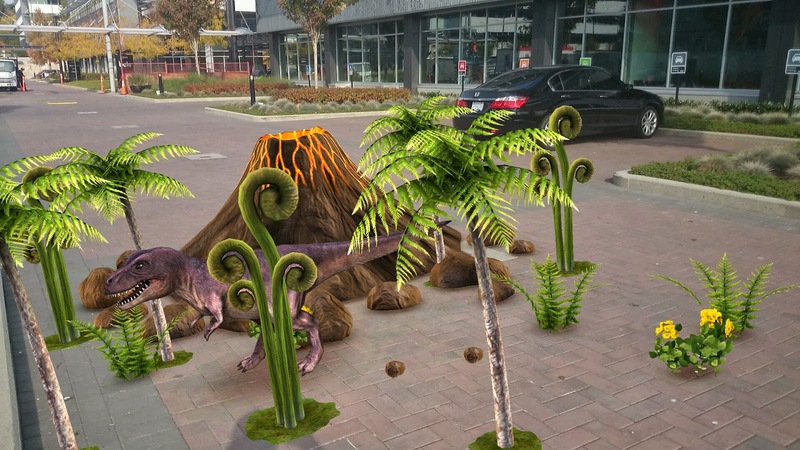 One of the fun additions is AR Effects. Sony uses augmented reality tech to project some funs scenes over whatever you are shooting. They have included scenes like dinosaurs, underwater coral reef and party themes. It is quite a fun addition and my wife and I have enjoyed using it. Social live is an app added that allows you to livestream whatever is happening to your facebook account. It also allows you to dynamically see peoples’ comments as they view what is going on. I have never been much of a livestreamer (or facebook user), so I didn’t get much chance to use it. Info-eye is Sony’s answer to Google Goggles. It will analyse a shot you take and give you information about it. Snap a shot of the Eiffel Tower, and it will give you information about it. Works not bad and it is definitely nice to have it integrated with the camera app, so you don’t need to jump around. One of the most important additions is the “more apps” button. Sony has released an SDK that will allow 3rd party developers to integrate their camera apps into the stock app. This is pretty amazing as you would not need to jump to different apps to do different things. There is already an Evernote app there that will allow you to snap shots and send to evernote directly. Also, this will allow other 3rd party developers to extend the functionality of the Sony camera app, while keeping it light weight. No need to have a ton of options you don’t need just to get some that you do need. It is safe to say that this is the best Sony phone out there. Many of the shortcomings that were found in the previous phones are not there is this one. Viewing angles still leave much to be desired, but most everything else fills in what you need to be a must buy smartphone. The size is definitely a factor for this phone and if you feel that it is just too big to use, it is probably not the phone for you. However, if you don’t mind the size and love having the piece of mind that your phone won’t die and the first since of water, then this is definitely a solid buy. You can pick it up for Rogers, Telus, Bell, or the Sony Store, where you can buy it unlocked. Rogers has it for $149 on 2-year contract and $599 month to month, with Black and Purple colours available. Telus has it for $99 on 2-year contract and $700 month to month, coming only in Black. Bell has it free on 2-year contract and $699 month to month, coming in Black and White. Unlocked at the Sony Store will set you back $699.99 and comes in Black and White.